Ziggy is a bold, curious and affectionate young gelding. He is royally bred with bloodlines boasting Quattro B, Burggraaf, Ramiro Z, Furioso Landgraf, Ladykiller, Pablo, Pilot, Nimmerdor and Cor De La Bryere to name a few. 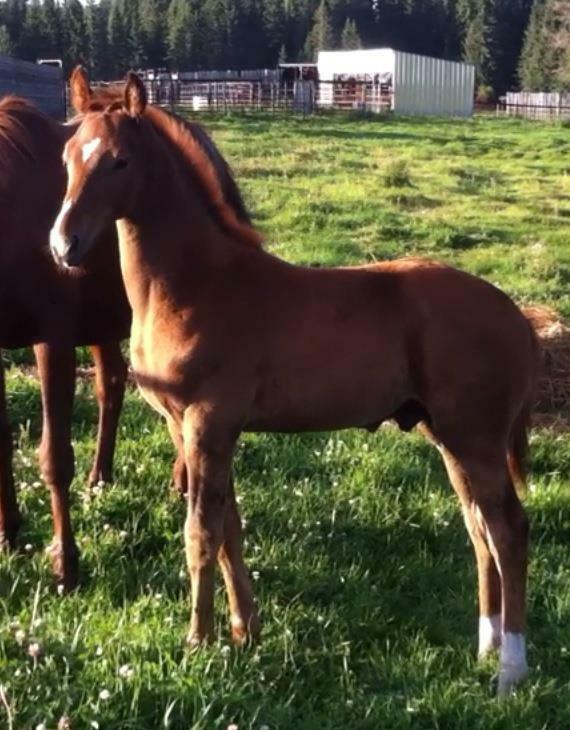 We have high hopes for this flashy chestnut gelding. This big boy takes everything in stride and has a very amateur friendly nature. He possesses beautiful movement and tremendous scope which will make him competitive in any ring. This gelding’s dam has also produced a Licensed Stallion who is now standing in New Zealand, evidence of the superior quality this mare has produced. He has the kind of temperament to make him a friend for life. He has been raised in a herd situation on pasture and well maintained for his long term mental and physical soundness. Ziggy Free Jump @ Age 3, summer 2015. Ziggy at Liberty @ Age 3, summer 2015.